Rockefeller Center in New York City known for having a beautiful Christmas tree. It has been one of the most stunning visual for the holiday. 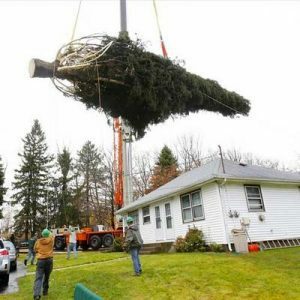 This year stood a 22.8 meters and roughly 12 tons Norway Spruce from Pennsylvania. 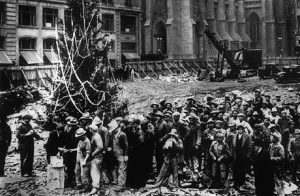 But the story of Rockefeller Christmas tree does not stop when the holiday’s over. After lighting up West 28th and 51st streets and Fifth and Sixth Avenue, the tree would be recycled. Not to be just any recycled material, but becoming house materials for the unfortunate. 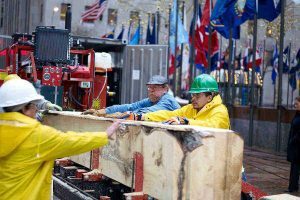 Rockefeller Center has partnered up with Habitat for Humanity to put the recycled wood into good use. It will be part of the woods used to make build houses for less fortunate. Following the program that has started in 2007, this year would be no different. Having lit from November 29th 2017 to January 7th 2018 the tree would be brought to New Jersey. But the recycling journey does not start in New Jersey. First the tree would be cut into large pieces in the Plaza before being brought to New Jersey. Then It will be milled and treated and kiln-dried it before becoming lumbers for home material. The woods are not going to be made into one house only. it rather would be frames for interior and exterior and other building materials. The tree will form 5 by 15 cm and 5 by 10 cm beams. The beams later shipped to chosen Habitat for Humanity’s affiliate. The lumbers then would be used in different ways. It has been used to block and frame interior and exterior walls. It also used for cabinetry, bathroom accessories and shelving. Some also turned it into display pieces so it could be cherished in the house owner’s everyday life. 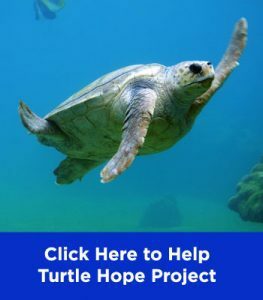 The usage decision is made after the Habitat for Humanity’s affiliate is chosen. The selection process is much to do with timing. For example, Habitat for Humanity Coastal Fairfield County’s staff wanted to share to as many people the joy of knowing that a part of the 2013 Rockefeller Center Christmas tree was in their home. Hence, they placed a few beams from that one tree into every home that’s been built since. Even two years later they still have some of the beams left to share. Habitat for Humanity of Greater Newburgh (New York) chose to use the lumbers in a house that was in active construction on a once-blighted block in the city. Having already built 22 houses prior in the area, they wanted to commemorate the honor of receiving the lumber from the Rockefeller Centre Christmas tree by making it into a permanent part of newest neighborhood in Newburgh. In most cases, the lumber goes to Habitat for Humanity’s affiliate in the original tree comes from. In 2014 the tree went back to Philadelphia. Finding a use for the framework of five different homes in the city. In 2013 it went to Bridgeport, Connecticut. However, an exceptional was made in 2007 when the tree which originated in Shelton, Connecticut but the lumber was used in Pascagoula, Mississippi. It turned into a new house for Hurricane Katrina’s victim. Although the collaboration with Habitat for Humanity started in 2007, the first project happened in 2005. After Hurricane Katrina struck the Gulf Coast, Warner Music, NBC and Tishman Speyer teamed up along with oven 1,000 volunteers in helping build frames for 45 houses destroyed by the hurricane. That inspired Tishman Speyer to donate their annual Christmas tree at Rockefeller Center since 2007. The first tree recycled was in 1971 giving about 30 bags of mulch. The mulch was spread across nature trails around the city. It then also given to Boy Scouts of America to sell. The profit then would be used to fund the organization’s activities. While the biggest part of trunk back then was donated to the U.S. Olympic Equestrian Team headquarter in New Jersey, where it was used as the training obstacle jumps. 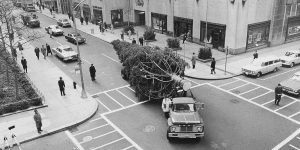 In 2007 not only Rockefeller Center teamed up with Habitat for Humanity but taking one other major move toward a eco-friendlier Christmas celebration. Rockefeller Center replaced incandescent bulbs to LED lights. Plus, they are powered by solar panel located on the rooftops of Rockefeller Center building. This transition helps to save 1200 kwH a day. A statistic comparison by Mental Floss reveals “It’s estimated that a family in a 2000-square-foot home would use 1200 kwH to power their household for an entire month.” The tree itself decorated with 45.000 lights using a five-miles-long wire. 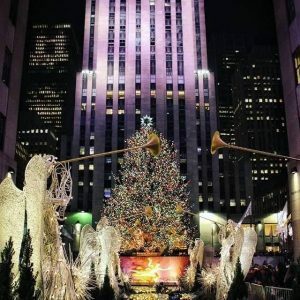 You may think that Rockefeller Center pays for Christmas tree. The truth is people donate the tree every year to them. Rockefeller center bear the transporting fee and the original owner of the tree feel the joy of knowing their tree are enjoyed by many. But it does not make the search for the perfect Christmas tree less serious. The hunting process begins more than a year prior. “It’s an all-year process, where I’m constantly looking for trees to put on the list,” Erik Pauze said. “I go around and visit prospective trees. If you get a tree that’s halfway decent looking, and you go visit it and it looks good in the picture but you get up close, and it’s not, then you go around that area, because maybe the climate and the weather isn’t too bad, so there may be another good one there.” Pauze first saw the 2017 Christmas tree in 2010. He’d visited the tree since to monitor the growth and talk to the owner, Jason Perrin. 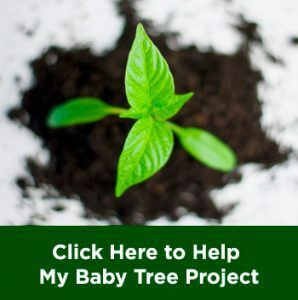 The story of the tree is not only as a beacon of festivity in New York City and symbolizing hope for the needs, but it also inspired a children’s book writer. David Rubel wrote “The Carpenter’s Gift” in collaboration with Habitat for Humanity as well. The book is illustrated by Jum LaMarche and published on September 27th 2011 published by Random House Children’s Books. 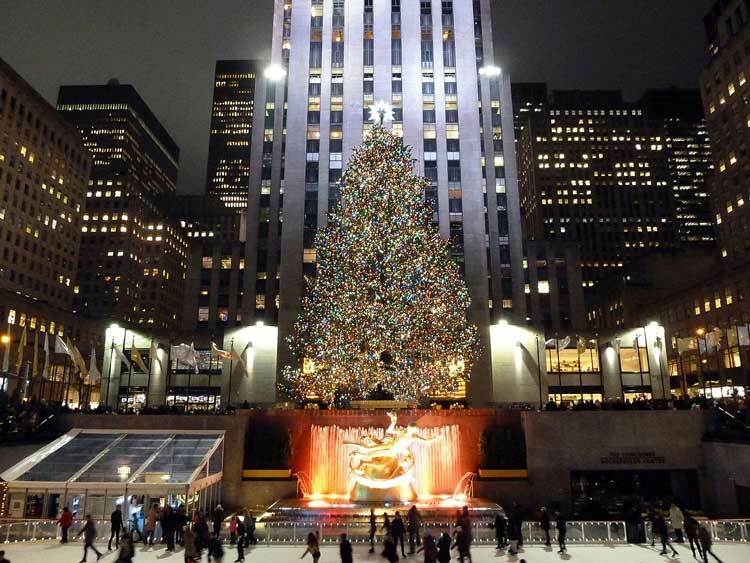 Interesting fact, around 15% of 2012 Rockefeller Center Christmas tree was used for paper production for the book.